Thailand's army distributed 2,700 assault rifles to volunteers over the past two months to fight insurgents in the south, officials say. The policy comes amid a spike in violence in the conflict which afflicts the Muslim-majority provinces. However, human rights groups say that arming civilians will only aggravate the situation. The government, which took power in a coup this year, has pledged peace in the region. On Monday two people were killed and three others injured in a drive-by attack when a gunman in a pick-up truck opened fire at five people in another vehicle in Pattani province. 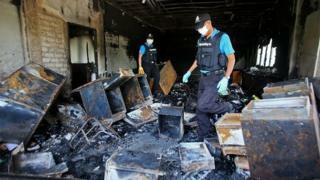 Several rebel groups are fighting for more autonomy for the ethnically-Malay region in Thailand. Since the conflict began in 2004 about 6,000 people have died. The BBC's Jonathan Head in Bangkok says it is one of the most complex and intractable situations in Asia. The guns were distributed to civilian volunteer squads of local residents to help them take on the separatist movement. "They need weapons for self-defence... they can't fight with just wooden sticks," a security official told the AFP news agency. "They are for security volunteers... who are stationed at provincial halls, district offices. They will also protect governors and district chiefs," he said. Most of the weapons had been distributed to Muslim villagers, he added. General Prayuth Chan-ocha, the Thai Prime Minister, has vowed to end the conflict by next year, but has not spelled out how. Successive Thai governments have made the same pledge, with little to show for it, our correspondent reports. Guns have been distributed to Muslim and Buddhist villagers before this, but some fell into the hands of the insurgents themselves or resulted in incidents where volunteers opened fire on unarmed civilians. Right groups have condemned the distribution of guns saying it would only increase violence in the region. Ongoing peace talks with rebel groups came to a stand-still when the country was plunged into a political crisis earlier this year.